It is a known fact that sites across Serbia are being dug over and destroyed by treasure hunters and antique traders, and that valuable cultural artefacts are ending up in auctions or antique fairs in the West, where they sell for amounts which, although very high, far reflect their actual cultural value and significance. This phenomenon is not limited to Serbia. Smuggling of artworks and antiques is estimated to be among the most lucrative forms of smuggling, and seizures of cultural goods are growing all over the world, which could indicate an increase in this phenomenon. Given the importance of cultural heritage to societies and the economies of countries, as well as the fact that a portion of the proceeds obtained illegally through the trafficking of stolen and smuggled artworks and antiques is often used to finance international organized crime and even terrorism, the Customs Administration of Serbia is putting up a strong fight against this criminally-linked phenomenon. Serbia’s efforts in this regard are particularly relevant in 2018, being the European Year of Cultural Heritage. The European Union, who chooses every year to address a subject in order to encourage debate and dialogue within and between member states, wish to encourage more people to discover and engage with Europe’s cultural heritage, and to reinforce a sense of belonging to a common European space. Serbia is either the country of origin of smuggled cultural property, arts and antiques, or a transit country, but generally not the final destination. Indeed, art smugglers are constantly looking for passages and routes to specific European countries, where they can find a market for these sorts of goods. Serbia Customs started building its capacity to protect cultural property a while back. In 2006, it developed “Guidelines for Identifying and Assessing Antiques and Rarities,” a publication which contains detailed content and rich photographic material. This handbook offers basic guidelines for establishing the approximate values of antiques and rarities, and describes several methods used to move them illegally across borders. It covers paper antiques, old books, engravings, geographic antiques, antique furniture, jewellery and precious decorative objects, gemstones, clocks and watches, coins, paintings, antique icons, and various other antiques. Moreover, Serbian Customs officers regularly participate in training exercises and workshops on a variety of topics related to the fight against the illicit trafficking of cultural property, as well as on issues such as the restitution or return of cultural objects, preventative measures, and risk mitigation. In November 2017, such a workshop was organized by the United Nations Educational, Scientific and Cultural Organization’s (UNESCO) Regional Bureau for Science and Culture in Europe, as well as by the Italian police. At the national level, the Customs Administration of Serbia cooperates with the Ministry of Culture and Information, the Institute for the Protection of Cultural Monuments, the National Library, as well as with several services within the Ministry of the Interior, especially the Service for Combating Organized Crime. Through the Ministry of the Interior, Serbia Customs also maintains good cooperation with the Public Prosecutor’s Office and the Special Prosecutor for Organized Crime, as well as with the European Police Office (EUROPOL) and INTERPOL. The Customs Administration has also established cooperation mechanisms with other Customs authorities, which are implemented on the basis of signed agreements. As part of Serbia Customs’ cooperation agenda, it has also actively participated in regional or international operations targeting cultural goods, such as ODYSSEUS, AUREUS and PANDORA. In terms of regular international data exchange, a substantial amount of information is received from INTERPOL on objects of significance to cultural heritage. Along with basic information on the items, the Customs Administration also receives photos of the objects, which allows for easier identification. Such information is received by the Customs Intelligence Department and then passed on to all Customs offices, including the Administration’s Anti-Smuggling Department. Last but not least, information on seizures of cultural goods is shared with other Customs services through the ARCHEO platform, the WCO’s real-time communication tool for the exchange of information and cooperation in the protection of cultural heritage. Information reported on the platform enables enforcement officers to learn about new smuggling methods, and cases seen as most interesting are shared with all Customs employees. It is, therefore, of utmost importance that all Customs authorities share such information via the platform in order to enhance their risk analysis capabilities. Based on information to hand, it can be said that smugglers mostly use their own vehicles for smuggling artworks and antiques, with such vehicles often converted and modified to meet the smugglers’ needs. They also use bus drivers, giving them goods to be transported, or persons travelling frequently to Western European countries. For instance, in 2017, two gospel books from the XVII and XVIII century were found in the luggage of a bus passenger, and earlier this year, Customs officers at Gradina border crossing point found coins and parchment scrolls in Arabic script while scanning the spare tyre of a vehicle. 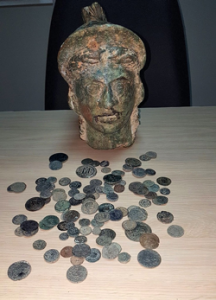 More antique coins packed in old newspaper and plastic bags, as well as a bronze bust of a Roman legionnaire and a metal-cast figurine of a bull, were also found hidden under the driver’s seat, in the armrest, and behind the backseat of the vehicle in a car at the Batrovci border crossing point. There were also attempts at smuggling icons of particular significance to the Eastern Orthodox Church. 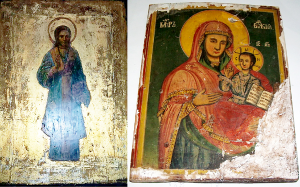 For instance, at Gradina border crossing point in early 2015, Customs officers uncovered two Orthodox icons hidden among luggage in the trailer of a vehicle en route to Western Europe, thus preventing these precious religious objects from being lost to these lands and the communities that treasure them. authorize museum employees to offer expert assistance to Customs and police officers at border crossing points for identifying and assessing items suspected of being the subject of illicit trafficking of cultural property. Given the fact that cultural heritage has a universal value for all, whether as individuals, communities or societies, and in recognizing the importance of preserving this heritage for future generations, the Customs Administration of Serbia is determined to continue acting as a strong barrier to smugglers. Its continuing enforcement action, complemented by other national efforts to protect cultural property, will surely result in further successes in denting this illicit trade.